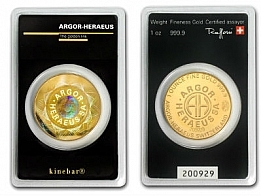 Brand new and sealed 1 Troy Ounce (31.105 Grams) Gold Bullion 999.9 Fine UBS Kinebar. Supplied sealed in original UBS packaging with certificate. 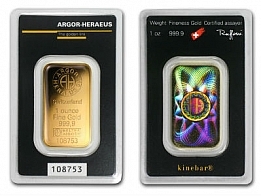 Each 1 Ounce UBS gold bar is produced by Argor Heraeus, one of Switzerland's most prominent precious metals refineries, for the bank. Along with Credit Suisse, UBS was one of the first banks to introduce smaller sized precious metals investment bars so that the bank's clients would be able to invest in gold and silver. 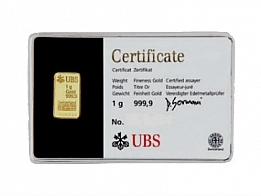 UBS produce a gold bar in 1 gram, 2 gram, 5 gram, 10 gram, 20 gram, 1 ounce, 50 gram, 100 gram, 250 gram, 500 gram, and 1 kilogram sizes. 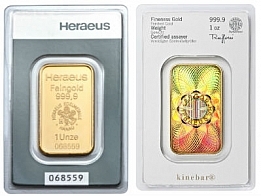 The 1 Ounce UBS gold bar is the most popular size bar that UBS produce. UBS also produce investment bars in silver, platinum and palladium. The front of the UBS gold bar features the UBS logo, with the weight, finenesss and serial number of the bar. Each bar is individually sealed in its own certicard.